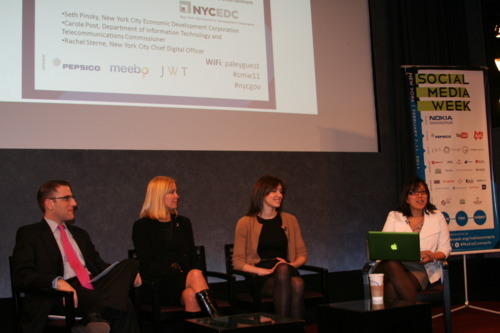 During Friday's Social Media Week panel titled Open Government and the Transformation of New York City's Digital Environment, NYCEDC President Seth Pinksky (@sethpinsky), Commissioner of the Department of Information Technology and Telecommunications Carole Post, and newly appointed NYC Chief Digital Officer Rachel Sterne (@rachelsterne) discussed the ways technology to help transform the city—ushering in an era of connectedness between business and government and the public. CDO Sterne stressed that the media and technology plan for the city was being formulated around ideas of greater cohesiveness in media and social media strategies. These are all great ideas, but what do they mean and how do we get there? Tech evangelist Laurel Ruma (video below) can offer some ideas on putting these ideas into practice. During her Ignite talk during Web 2.0 NYC 2010, Ruma drew on key examples of how geeks, technologists, and other data-minded folks can participate in this process. Edward Tufte's work in data visualization is a key example in breaking down data into understandable essences. How do you explain pork belly spending? As Ruma demonstrated, you give the public graphics showing pigs, barrels, and money. The point is not to offend the intelligence of interested public, but to tell a story to people who don't understand APIs. It's about bringing as many people to the conversation as possible. Ruma advocated for turning data into apps that people can use. For example, Boston has an app that informs residents about bus schedules—I'm never late for work, she quipped. But there is more to just the informative power of an app such as this one: it adds a level of unity to the system and accountability as well, as it provides a real measure against which anyone can gauge the effectiveness of service delivery. According to Pinsky and Post, New York City gets it. Pinsky made reference to the Trees Near You app, designed to help New Yorkers and others learn more about the trees in NYC and the benefits they offer the city. NYC Business Express is meant to make the process of doing business in NYC transparent. The NYC Simplicity Idea Market is designed to foster collaboration between city employees and agencies to design systems, services, and organizations that work—from the bottom up. But of greater importance is the ways New York City is working to bring access to these services and information to more than just the smartphone crowd. There are more than eight million New Yorkers in the immediate metro area, and while most, if not all, have access to some sort of mobile technology, not all of them are players in the smart phone industry. While apps have great business appeal, technology needs to address the needs of these individuals too. Post reported that New York City is looking into text messaging as a means of distributing emergency information due to its broad reach. Agencies like OEM already send out "Notify NYC" emails to inform recipients of subway delays, missing persons, traffic disruptions, and more. Sterne is also on Twitter, helping to raise awareness about the various agencies and services that currently share information via the popular social media site. There are some exciting possibilities here for New York City to connect with residents and business owners. The first step, however, will be for Sterne to complete her 90-day report on the state of social media and communications in New York City, which she has indicated will be publicly available. Then we can begin to sketch out digital network for New York City. It will certainly be an exciting process to watch unfold.